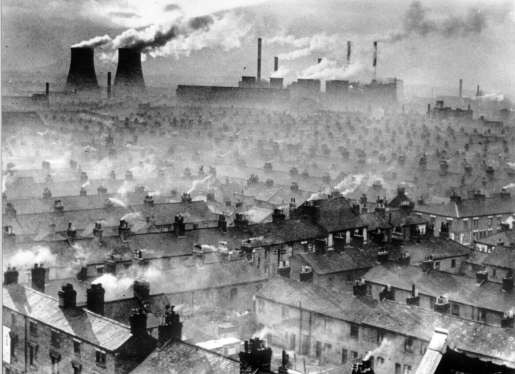 Domestic and industrial air pollution when the use of coal and wood for heating was common. Poor air quality may affect your health. Below you will find a list of the main ambient pollutants and their potential health effects. When considering health effects of air quality the total exposure should be considered. This includes indoor (e.g. in houses or cars) air pollution which is often also a cause for concern. This website focuses on outdoor air quality. Fine particles can be carried deep into the lungs where they can cause inflammation and a worsening of the condition of people with heart and lung diseases. In addition, they may carry surface-absorbed carcinogenic compounds into the lungs. Nitrogen dioxide can irritate the lungs and lower resistance to respiratory infections such as influenza. Continued or frequent exposure to concentrations that are typically much higher than those normally found in the ambient air may cause increased incidence of acute respiratory illness in children. Ozone irritates the airways of the lungs, increasing the symptoms of those suffering from asthma and lung diseases. Possible chronic health effects include cancer, central nervous system disorders, liver and kidney damage, reproductive disorders, and birth defects. Even moderate concentrations may result in a decrease in lung function in asthmatics. Tightness in the chest and coughing occur at high levels, and lung function of asthmatics may be impaired to the extent that medical help is required. Sulphur dioxide pollution is considered more harmful when particulate and other pollution concentrations are high. This gas prevents the normal transport of oxygen by the blood. This can lead to a significant reduction in the supply of oxygen to the heart, particularly in people suffering from heart disease. Even small amounts of lead can be harmful, especially to infants and young children. In addition, lead taken in by the mother can interfere with the health of the unborn child. Exposure has also been linked to impaired mental function, visual-motor performance and neurological damage in children, and memory and attention span. TOMPs (Toxic Organic MicroPollutants) are produced by the incomplete combustion of fuels (or waste). They comprise a complex range of chemicals some of which, although they are emitted in very small quantities, are highly toxic or carcinogenic. Compounds in this category include: PAHs (Poly Aromatic Hydrocarbons), PCBs (Poly Chlorinated Biphenyls), dioxins, etc. TOMPS can causing a wide range of effects, from cancer to reduced immunity to nervous system disorders and interfere with child development. There is no "threshold" dose - the tiniest amount can cause damage.